Hidden in the beautiful South Devon countryside with spectacular views of the Breakwater and the Cornish coast, Bovisand Lodge Holiday Park is a unique 4 star, gold award beachside holiday Park. Bovisand Lodge Holiday Park is situated in a tranquil wooded valley running down from the hills of Staddon Heights, the extensive grounds adjoin the coast; here you’ll find a pleasant public sandy beach. The adjacent South West Coastal Path is perfect for long or short walks and you’re guaranteed spectacular coastal views. It’s a quiet holiday destination yet only seven miles from the conveniences of Plymouth City Centre. Guests have use of the indoor heated swimming pool and sauna (open all year round) a small children's play park, launderette and surrounding grounds for badminton, football and kite flying. Meet our friendly goats when you complete our brass rubbing trail in the woodlands and feed our chickens. 3 Heritage Apartments located in the east wing of the Georgian Grade 2 listed Lodge. Owned by the Hart family for over 50 years, this wonderful beachside holiday park offers peace and tranquillity in a beautiful natural environment, with an abundance of wildlife. By popular demand Bovisand Lodge Holiday Park has no club house or restaurant - these can all be found a short drive away. 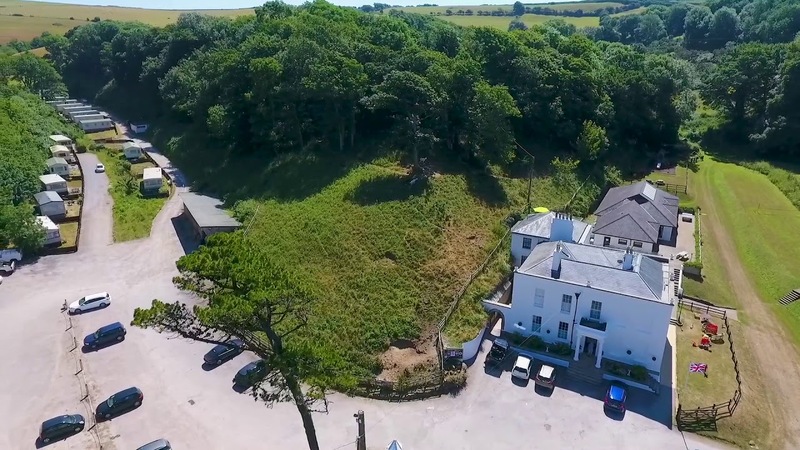 The holiday Park is an ideal base to explore the local area - the historic city of Plymouth, quaint fishing villages of Cornwall and the rugged splendour of Dartmoor. Special offers; promotions for couples and two week bookings; short and mid week breaks are all available outside the main school holidays including 4 nights for the price of 3. Please call us for details. *Two bedroom home from £375.00 out of season to £810.00 in the height of the season. Three bedroom home from £480.00 out of season to £960.00 in the height of the season. All our homes are double glazed, centrally heated and less than 3 years of age. Short and mid week breaks available. Promotions for couples and two week stays. Telephone for details. Film or TV location - Who do you think you are America. Filming in 2014 with Rachel McAdams who relative worked in the Lodge in the 1800's. Ask us for more information. Midweek breaks - Monday - Friday - 4 nights for the price of 3. From A38 Exit A38 at Marsh Mills. Take A374, Plymouth City Centre. Exit A379 Kingsbridge. Over bridge then take Plymstock exit. On Pomphlett Road to traffic lights at crossroads. Turn right into Dean Cross Road. Through traffic lights signed Turnchapel & Hooe. Go 1.5 miles & bear left into Jennycliffe Lane. Through 1-way system & up hill to Staddon Heights, past golf course, 2nd turning on right down hill signed Fort Bovisand. At car park do U-turn & take lower road to Bovisand Lodge Estate. From Plymouth 6 miles. As we are a rural location we recommend the use of a car.